What is the secret to success in a career? Where do you go upon graduation? What are the vital business skills needed in succeeding? If life were to bring you down, how can you motivate yourself to climb up again? 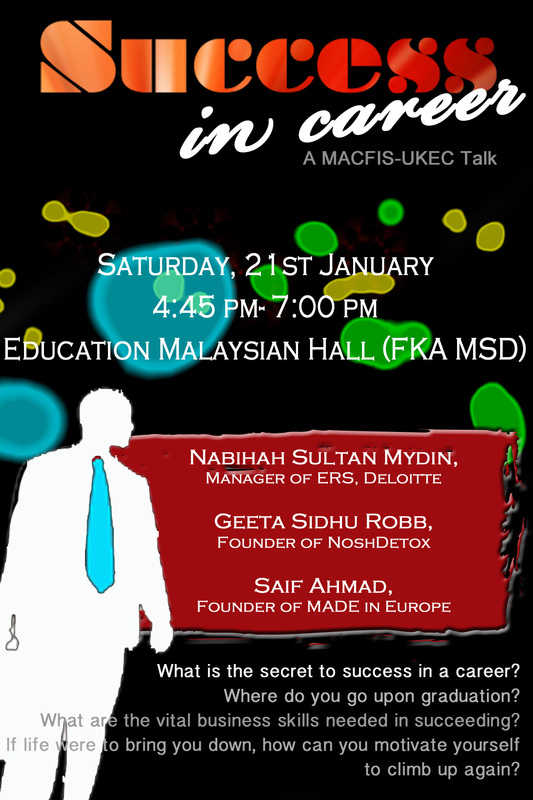 Come and join the MACFIS-UKEC career talk, and get some insight to living as a successful entrepreneur! Miss Nabihah graduated with a BSc in Accounting and Finance from the London School of Economics and Political Science with First Class Honours, by which during her studies, she had held the General Secretary post in MACFIS in 2006. Upon graduation she went on as an ACA Chartered Accountant, certified by the Institute of Chartered Accountants in England and Wales. She is currently the Manager of the Enterprise Risk Services Department in Deloitte, London. She is currently the Manager of the Enterprise Risk Services Department in Deloitte, London. Miss Geeta graduated from the London School of Economics and Political Science with a bachelors degree in Law. She went on to become a corporate lawyer, until her son’s multiple allergies required her full medical attention, which inspired her to take lessons in becoming a Medical Intuitive. In 2008, with her knowledge on body-workings and natural food, she founded NoshDetox. Mr Saif Ahmad began his career in charitable organisations when he was first head hunted to become CEO of Muslim Aid, a UK-based humanitarian and development agency working in over 70 countries worldwide, back in 2006. There he was inspired to create an organisation that aimed to inspire the European Muslim youth to stand up and fight global poverty, with volunteering and fundraising activities, and thus he foudned ‘MADE in Europe’. He is also the founder and former CEO of Faith Regen Foundation, an organisation that helps ensure employment opportunities for the disabled. 1) To enable students to gain new skills and knowledge related to business. 2) Give students an idea on what to consider when thinking about future career. 3) Help students to instil motivation, drive and courage to succeed. 4) Let the students know and feel the real life experience of successful entrepreneur. 5) To give an exposure to Malaysian students on business opportunities in the real world provided in profitable and non-profitable organisation in Malaysia and United Kingdom. 6) To provide an interactive platform for students to discuss current business and financial issues with experienced speakers on a more personal level. Got questions? Check out our event page, http://www.facebook.com/events/228854800526061/ for further info. See you there!